Flooding from heavy rains and coastal flooding due to storm surges combined with heavy rains have been a common occurrence in recent years. 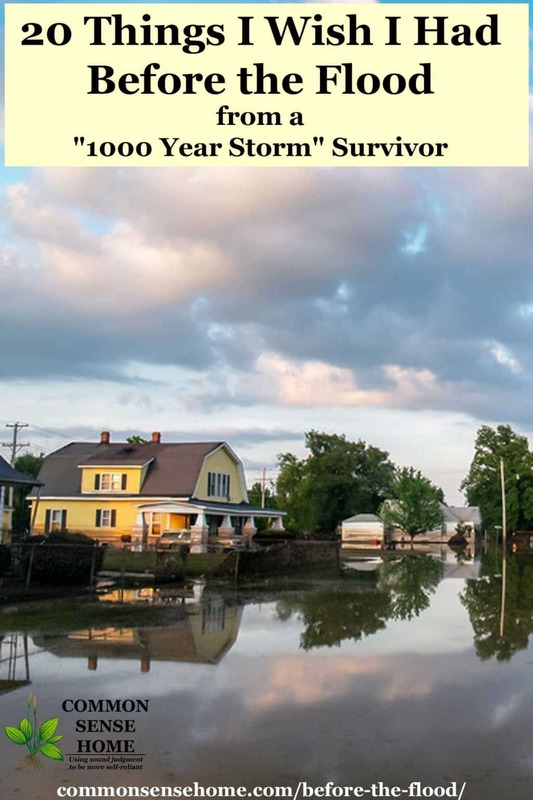 In this post, I'll share my flood experience, focusing on the flood preparedness items I didn't realize I needed – until the storms hit. We also talk about dealing with floodwater contamination in the yard. I want to share this flood preparedness checklist with you so you can avoid the mistakes I made. The catastrophic flash flood that affected much of the Carolinas (and my home) was like nothing I've ever seen. I consider myself to be a prepper of sorts – always planning ahead, with a stocked pantry, medicine cabinet and survival skills. I thought I was ready for any situation, but I wasn’t ready for this. By the looks of things, neither was anyone else. The Super Harvest Blood Moon created perfect waves for my husband (the surfer) all week, but it also created unusually high tides. The Pawleys Island law enforcement closed off the island to onlookers and tourist all week due to flooding. Homeowners could access the island at their own risk. Of course that didn’t stop the die-hard surfers (hubby included) willing to walk a mile to catch the perfect wave. While Hurricane Joaquin is predicted to miss the U.S., it combined with low pressure area that is funneling heavy tropical moisture into the region. 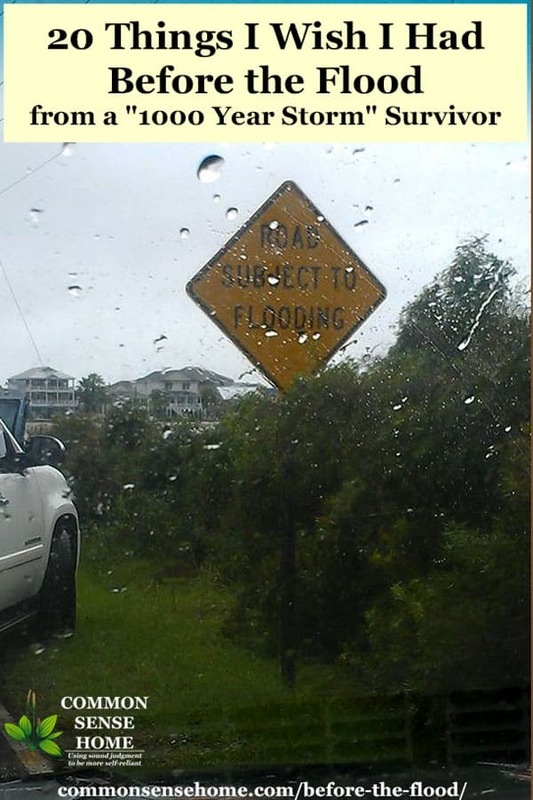 This has led to record breaking amounts of rain being dumped in South Carolina. Governor Nikki Haley called it “a thousand year storm” with “catastrophic flash flooding”. Many are dead. There have been hundreds of accidents, thousands are without power and an unknown number are displaced from their homes. Half of our town is under water, roads to and from here are closed, bridges are wiped out, and people are waiting for rescue as the water levels rise. Where does that leave us? Right in the middle of it. We live right by the ocean (exactly 4 minutes from my home to the Atlantic Ocean) on the east coast of South Carolina in a quaint town called Pawleys Island. Up until now, this has been our tropical paradise. We were very blessed, but not completely unscathed. Our property damage was minor compared to many. I've put together this flood preparedness checklist to highlight things I didn't think I needed, but wish I had when we were stuck in the flood zone. 1. Bottled water – I don’t stock bottled water for the same reason I don’t stock plastic bags – they are not environmentally friendly. But guess what? I needed them. See Emergency Water Storage and Filtration for tips on safely using flood waters. 4. Matches – I know this seems like a no-brainer but we didn’t have one match in the house. We had plenty of candles, and not one match. 5. Zip lock bag of fire starter. We have lots of kindling – but guess where it was when the rains hit? Yep – outside. 6. Extra propane tank. We forgot to fill ours the last time we cooked out. We could have avoided this mistake had we had an extra tank. 7. 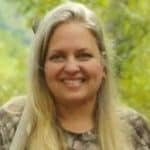 Battery operated weather radio – the power went out and continues to go out all around us, alarms keep posting on our cell phones warning us of the eminent flooding danger. A weather radio is a must! 10. Umbrellas – I normally don’t care enough about getting wet to invest in an umbrella, but when it is pouring so hard you can’t see in front of your face, an umbrella is a handy invention to have around. 11. Soy or beeswax candles. We have plenty of regular candles, but nothing I would burn inside the house because of the added synthetic fragrances. The last thing I need is a migraine and my daughters’ asthma kicking in when we are dealing with an emergency situation. Having safe candles to burn inside the house is imperative. 12. Charged Solar Lights and Flashlights. I had both, several of both actually, and they were all dead. Not a lot of good in the middle of a storm. Charge emergency lighting before the flood (and power outage) and keep them handy. 14. Access to shovels and hoes. 5am in the morning with lightening popping all around is not the ideal time to search through a pile of metal handle yard tools to find a shovel to cut a trench away from your home to aid in water runoff. 15. Extra garden hose. A garden hose acts as a wonderful siphon to remove excess water. We had to use one to remove water from the top of our pool and keep our cover from collapsing. 16. Trash bags, zip lock and plastic grocery bags. Several years ago I vowed to give up plastic bags, and I did. Unfortunately for us we really needed them during this time. I was able to leave and go to a nearby store and ravage their recycle bin for several handfuls of plastic bags which saved us! 17. Extra trash can (clean and big) with a lid. During several days of rain like this, and everything is flooded, where are you going to put your trash? Not outside! Now add stinky diapers into the mix. See why you need an extra trash can (BIG) with a lid? 18. Bleach – again, going green I removed all the synthetic cleaners from my home and bleach was one of them. I will be the first to admit, there is a time and a place for everything. During an emergency situation is a time and place for bleach (and plastic). 19. Feminine products. If you have a female in the house you will need a stash of feminine products. 20. Last but not least, a portable toilet. This should have been number one (and two! Haha) but I saved the best for last. During the flooding, our septic system became flooded and we couldn't use the sewer system. Before the flood, we had converted all of the gray water over for irrigation, so our showers and sinks were still usable. But we are not able to use our toilets for a family of 5 with three females. We immediately started to panic (the girls anyways) and quickly devised an emergency porta potty. (That pool noodle will never be the same again.) See our setup in the post, “DIY Portable Toilet, Plus Tips to Get Rid of Smells“. We figured that the cleaning process could likely be accelerated by adding beneficial soil microbes, such as Bio SI Lawn and Garden Select Soil Conditioner. My heart and prayers go out to all of those who have lost loved-ones or have been displaced from their homes due to floods. Although I hope to never encounter this situation again, I know I will pay better attention to my prepping list for emergency situations. I hope this flood preparedness checklist helps you to spot anything that may be missing from your own flood preps. Regarding safe candles (#15), another feature to look for is all cotton wicks. At least some candle wicks have a metal core, the burning of which releases toxic fumes. Soy wax is not a good choice for a host of reasons—palm oil wax is far superior—details here: http://www.alohabay.com/planet/index.html. I don’t think anyone knew it was going to be this bad. We didn’t lose power or have any damage other than a little bit of water in the basement and barn, but like you, there are a lot of things I wish I’d done to prepare. Like bringing extra hay down from the shed to have in the barn at the ready. At least we know for the future, although I hope we never have this much rain again. 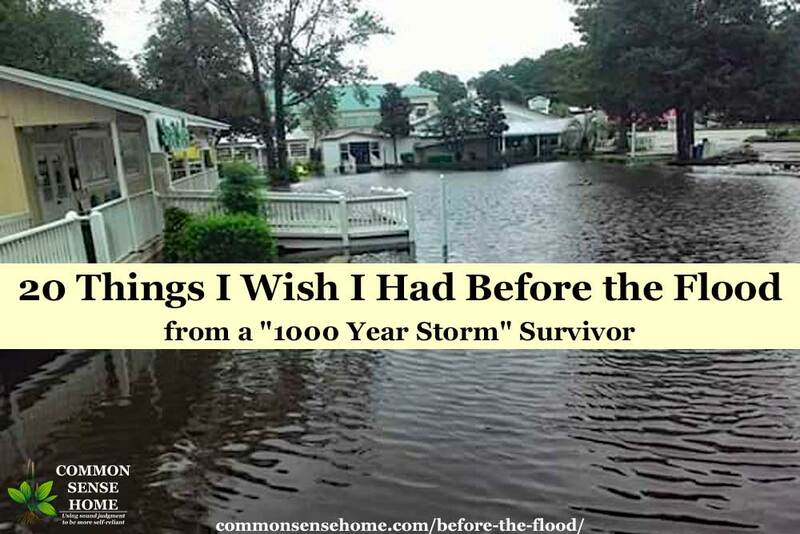 Yours is a great list, but as someone who has grown up on the North Carolina coast and weathered many storms, you might want to add disposable diapers and baby formula/food for those who need them. I always make sure I have plenty of pet food, and that all necessary prescriptions are filled. I usually make sure I have bottled water on hand in case potable water isn’t available, and that my laundry is done in advance of storms. Finally, its a good idea to have a full tank of gas in all vehicles. God bless you as you recover! Walmart sells oil lamps for under $10. (Ours was under $8). We used that during the Ice Storm, the 1000 Year Storm, and Hurricane Matthew. Any 2 liter bottles of soda get rinsed and filled with water when finished.